The Residence Inn Tampa Downtown gives guests three more reasons to make Tampa their go-to destination. The extended stay hotel is announcing three exclusive new deals available only during the month of November. TAMPA, FL--(Marketwired - Oct 29, 2014) - Travelers are flocking to Florida for the fall season and Residence Inn Tampa Downtown gives guests three more reasons to make Tampa their go-to destination. The pet-friendly Tampa hotel is announcing three exclusive new deals available only during the month of November, including discounts on parking, a special offer on one-bedroom suites during Thanksgiving week, and an extra night to extend the savings. During November only, guests are invited to pay just $6 for parking at the hotel when they use rate code TRS, instead of the standard $14 rate. This translates to a savings of 57% for road-weary travelers, making travel easier and stress-free during one of the busiest travel months. Florida residents are invited to make Residence Inn Tampa Downtown their home for the holidays by offering an exclusive deal during the week of Thanksgiving. Florida residents booking anytime during the week can reserve a one-bedroom suite for the price of a studio, when they use rate code FR6. With a convenient location in the heart of the city, the downtown Tampa, FL hotel places you in the perfect spot to enjoy the holidays or visit with friends and family. Throughout November, guests can extend their stay, and their savings, by taking advantage of Residence Inn Tampa Downtown's exclusive Book Three Nights Get One Free offer. Guests using rate code BWG and arriving anytime Thursday - Saturday will receive a complimentary night for a three-night's stay. This gives guests even more time to enjoy all of the nearby sights and attractions surrounding the hotel. 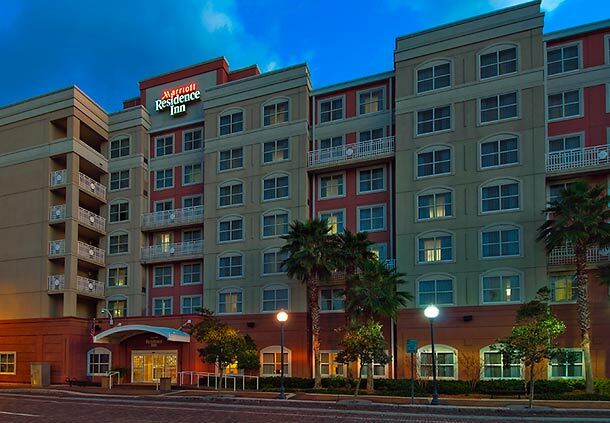 With delectable dining options onsite and just around the corner, plus easy access to the best the city has to offer, Residence Inn Tampa Downtown is the perfect gateway to an unforgettable Florida escape this season. The hotel is moments from the Straz Center for the Performing Arts, Tampa Convention Center, Amalie Arena, and the charming and historic Ybor City. For more information or to book these November offers, visit the extended stay hotel's website. The Residence Inn Tampa Downtown greets guests with comfort and style. Each of the property's studio, one- and two-bedroom suites offers full kitchens with granite countertops, enabling guests to create home cooked meals while staying in Florida. Guests can stay connected courtesy of free WiFi, or relax in front of a 32-inch flat-screen TV. Additional hotel perks include a free hot buffet breakfast daily and evening socials Mondays through Wednesday nights. To maintain a fitness routine, guests can check out the updated fitness center, with its modern equipment and personal flat-panel TVs. Or, soak up the Florida sun in the hotel's sparkling outdoor pool, spa, or SportCourt. Guests can also enjoy the hotel's impeccable location in the heart of downtown Tampa, FL, near the city's top attractions.